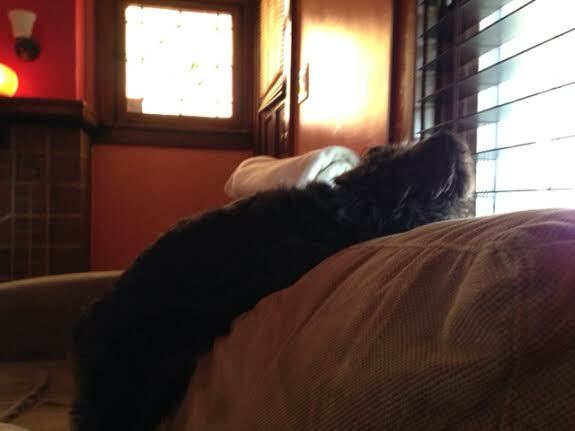 Here’s a picture of my dog looking out the window……. This may not seem like a great picture but here’s why I took it. The sun is out. Seeing the sun is a rarity in Pittsburgh. It’ll be gone in a few hours, it’s very fickle. We actually don’t want sun here because that would speed up the snow melt and cause flooding worse than is already occurring. Ughh that doesn’t sound good. The sun’s out here … For the second day in a row!!!! It was so pretty there. I couldn’t believe how sunny it was in March. Me too, I’m sooooooooooooo tired of waiting!! Ummmm. Well, I wore capris and a tank top to the park on Saturday. And jeans, sandals, and a t-shirt to work today. Says the California girl. I don’t think we ever had a winter here. Which is also why we are having a super terrible drought. We need rain BADLY. I will love it when I’m able to wear capris and a tank top! I had a patient once that was so short she wore capris as regular pants.